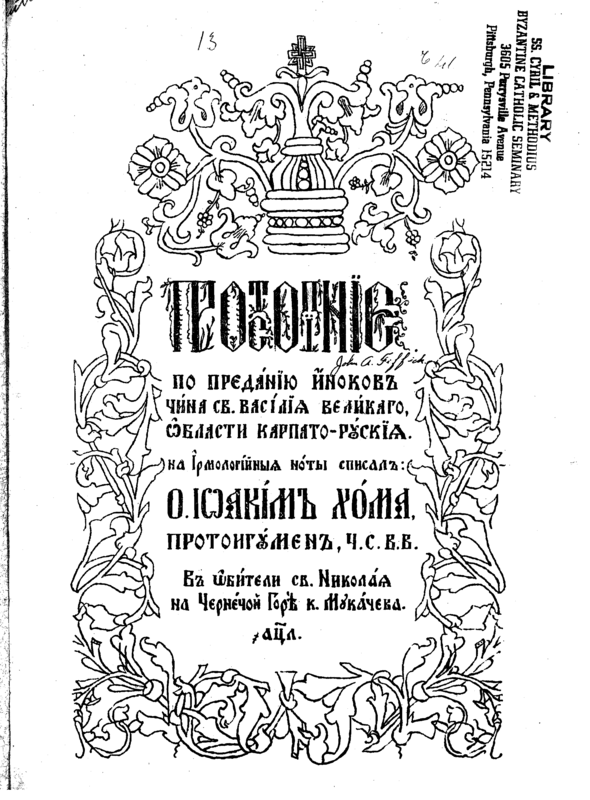 Khoma has a collection of the basic variable material for matins, vespers and Divine Liturgy. This does not have any of the common parts of the Divine Liturgy service. 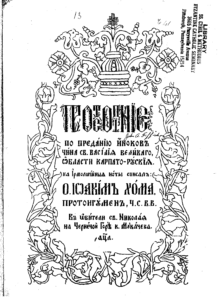 But it does include a section on the Presanctified Liturgy. 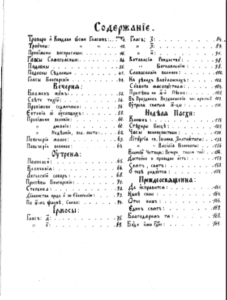 The book is in Cyrillic Church Slavonic but uses a square note music notation. 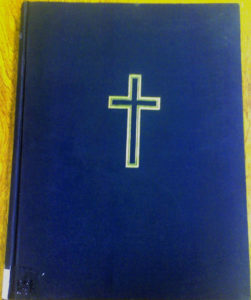 The publisher notation is a monastic community Chernecha Hora. Khoma, Joachim. Prostopiniie : po predaniiu inokov china sv. Vasiliia oblasti Karpato-Ruskiia. 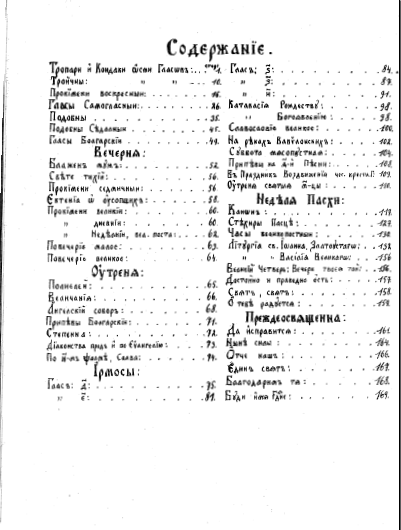 Mukachevo: Chernecha Hora, 1930. 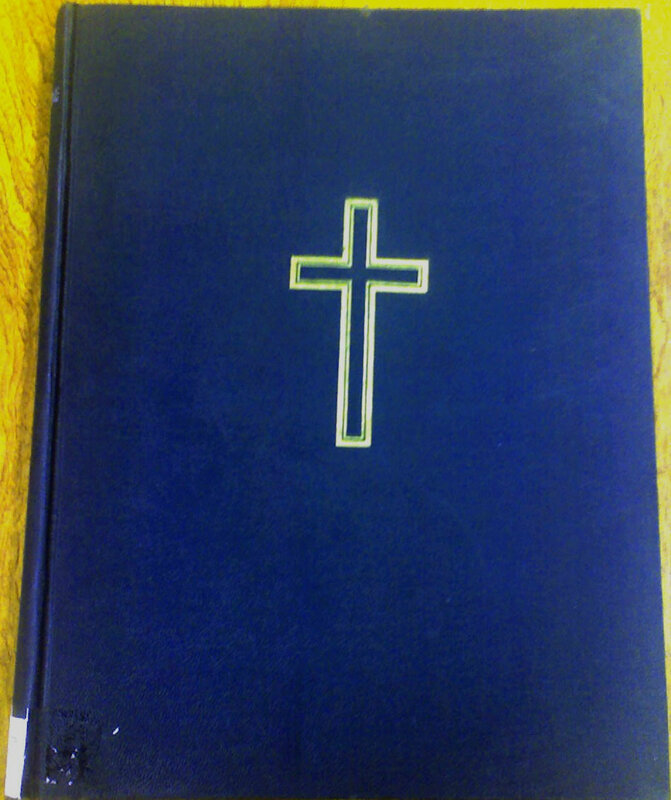 Hard Cover 9.5″ wide by 12.25″ high 169 pages. Cyrillic Church Slavonic Chant in western notation with square notes. If you will permitt me to be a llttie controvesial I have been asking people there re-actions to the Tridentine Masses they have attended. There is a feeling that perhaps there is `too much` emphasis on Gregorian Chant, and there is a need to also introduce Tridentine Masses with the other polyphonic music and hymns which were around before the Vatican Council. Certainly although I love Gregorian Chant there must be some flexibility so that worshippers can feel part of it all. Thanks. I have followed this blog but had not yet read this essay. It is great you poenitd it out to us. There are some CDs which are named “Eternal Chant”. Indeed, St. Gregory recognized both the simplicity and sublime nature of such. The epitaph of Pope Honorius only 40 years after the death of Gregory indicates the great Pope’s importance in encouraging Chant:”Gifted with divine harmony the shepherd leads his sheep to life . . . for while following the footsteps of holy Gregory you have won your reward.”Eternal music, indeed. If you will permitt me to be a ltilte controvesial I have been asking people there re-actions to the Tridentine Masses they have attended. There is a feeling that perhaps there is `too much` emphasis on Gregorian Chant, and there is a need to also introduce Tridentine Masses with the other polyphonic music and hymns which were around before the Vatican Council. Certainly although I love Gregorian Chant there must be some flexibility so that worshippers can feel part of it all. John – I certainly agree that the use of ppylohony is a great thing and would encourage it where possible. However in many places the problem is getting together a group of singers who can actually get the music together for the sung propers. Learning chant is a challenge; getting a 4-part choir together to sing ppylohony is a step further. As the use of the usus antiquior grows, our resources will have to grow to match it.Personally I agree with those who would allow the use of vernacular hymns in addition to the propers, for example after the Offertorium and before the Communio. The more purist approach is to insist that nothing be sung except in Latin.At the present stage of things, I am not too keen on the idea of Low Mass with hymns except occasionally, perhaps for a group of children. This can be done well but if it is a regular thing, it will decrease the motivation to have sung Masses rather than Masses with some songs.Where I would part company with you is in aiming to change things so that worshippers “feel part of it all.” There be dragons. We need to aim at providing the best music that we can with the people available and helping people to feel part of what is given to us in the tradition of Church music. Adapting the music to make people feel part of it is an approach that has led to disaster in the past few decades.